Wolfgang Puck's flagship restaurant features an evolved look and menu with a slightly more contemporary approach. Chef Wolfgang Puck was GAYOT's 2010 Best Restaurateur in the US. Watch our exclusive interviews with chef Tetsu Yahagi preparing heirloom tomato salad and tuna tartare on GAYOT.com’s Youtube channel. • Read about the 10th Annual Chefs Grand Tasting Dinner on the GAYOT.com blog. • Read about Friday Lunch at Spago on the GAYOT.com blog. 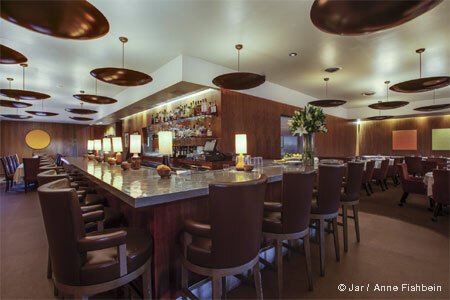 • Read about Spago's renovations on the GAYOT.com blog. : An extensive renovation in 2012 started a new chapter for Spago Beverly Hills, but Wolfgang Puck's flagship dining destination remains LA's quintessential restaurant. 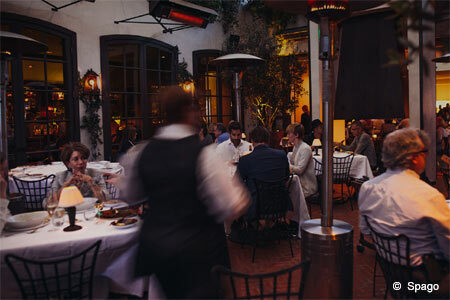 Puck, an Austrian native who also trained in France, made a splash in the City of Angels at the famed Ma Maison, following up with the grand opening of Spago on Sunset in 1982, Spago Beverly Hills in 1997, and numerous other restaurants across the country and beyond. Spago's design from Waldo Fernandez features shades of white and dark brown. Booths were added to the dining room, along with a larger glass dome in the ceiling and a clear glass wine cellar along one wall. The patio has a retractable roof as well as two outdoor fireplaces and olive trees. There is also a larger private dining room. Meanwhile, Puck, executive chef Lee Hefter and chef de cuisine Tetsu Yahagi have created a menu with a slightly more contemporary approach. Classic dishes, such as the smoked salmon pizza and wiener schnitzel, can be found on the lunch menu. At dinner, start your international (Asian, California, Italian) culinary voyage with the excellent and fresh "chirashi sushi" with big eye tuna, hamachi, salmon pearls and jalapeño-yuzu gelée. Continue with one of the several pastas on offer, like handmade agnolotti, or move on to main dishes such as the Prime New York steak with sauce bordelaise or the half Jidori chicken with truffles, goat cheese and Yukon potato purée. Augment your meal by choosing "From the Garden" a.k.a. side dishes, perhaps roasted Brussels sprouts with maple-miso glaze and sweet mustard vinaigrette. Desserts have included a soufflé en papillote matched with a mascarpone-stracciatella gelato. Guests can also choose from a pre-theater menu or California Tasting Menu. Phillip Dunn is the wine director, and the comprehensive wine list is a veritable book worth poring over. Note that a Bar Bites menu, featuring pot sticker dumplings, chicken wings and the like, is available at the bar only.